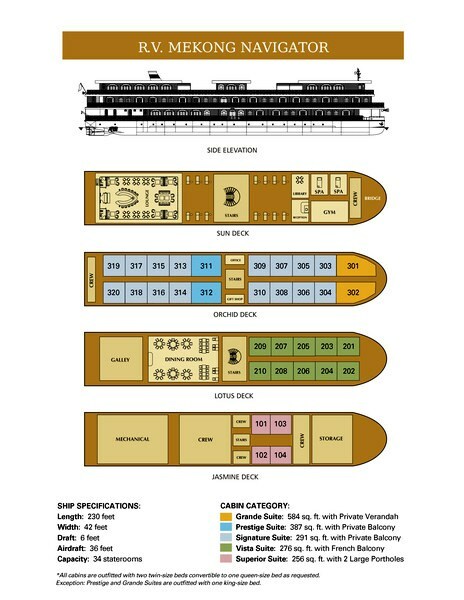 Lotus Cruises., Ltd makes arrangements for transportation, other than cruise passage, only as a booking agent. Lotus Cruises., Ltd’ s responsibility does not extend beyond the vessel. In arranging for the transportation of guests to and from the ship, Lotus Cruises., Ltd does so with independent contractors. Lotus Cruises., Ltd is not responsible for incidents such as airline cancellations, re-routings or any disruption of scheduled services or accommodation, or lost luggage. Travel documents will not be dispatched until full and final payment and passenger Contact Information has been received by Lotus Cruises., Ltd and cleared. For purposes of this Agreement, Contact Information shall mean a passenger’s full name, passport number, address, telephone number (land and mobile), electronic mail address and emergency contact information and any other information as requested by Lotus Cruises .,Ltd. Lotus Cruises .,Ltd must be able to reach each passenger’s emergency contact at any time of day. Lotus Cruises .,Ltd must, therefore, be provided with all information to allow Lotus Cruises .,Ltd to do so (such information should include the name, address, electronic mail address (if available) and phone number (including a cell phone number if available) of a parent, guardian, spouse, domestic partner, or other person to contact in the event of an emergency. No passenger will be allowed to embark Lotus Cruises., Ltd vessel unless Lotus Cruises ., Ltd has received all information. Lotus Cruises strongly recommends that guests are able to navigate the stairs on-board without assistance. Should guests require assistance, they must travel with someone who is able to assist them both ashore and onboard. Lotus Cruises., Ltd is unable to offer special assistance. Please note that wheel-on and/or wheel-off access is not available at ports-of-call. Baggage and personal belongings will be taken off the ship upon guest disembarkation. Under no circumstances will baggage be stored onboard without the owner of such baggage being on the vessel. Lotus Cruises., Ltd is not responsible for baggage stored in shore side facilities. Lotus Cruises .,Ltd reserves the right to pass through to its guests (including fully paid and deposited guests) any taxes and government fees/quasi-government fees that relate specifically to a guest’s itinerary. “Taxes and Government fees/quasi-government fees” include any and all fees, charges, surcharges, tolls and taxes imposed by governmental or quasi-governmental authorities including, but not limited to: customs fees, per person berth taxes or fees, embarkation and/or disembarkation fees at ports, airline transportation fees, dockage fees, and wharfage fees. Lotus Cruises., Ltd. reserves the right to charge a per person fuel supplement in the event that the price increases up to and including the day of embarkation. Lotus Cruises .,Ltd may collect any taxes, government fees/ quasigovernment fees and fuel supplement (the “Surcharges”) at the time of booking, prior to sailing or on board the vessel, even if the cruise fare has been paid in full. Surcharges will be invoiced accordingly. All fares, and itineraries are subject to change without notice. Additional restrictions may apply. Lotus Cruises., Ltd reserves the right to correct any errors or omissions. Our 7-night itinerary along the legendary Mekong River, as listed below, starts with a land transfer between Ho Chi Minh City and My Tho, Vietnam sailing upstream to Kampong Cham, Cambodia, and ending with a land transfer into Ho Chi Minh City. The itinerary also operates in the reverse direction, and may be extended with our land extensions in Bangkok, Thailand, Ho Chi Minh City, Vietnam, and/or Ha Noi and Hal Long Bay, Vietnam. This afternoon guests will enjoy a scenic drive from Ho Chi Minh City to the port of My Tho, where your upstream journey begins aboard the luxurious Mekong Navigator. Following a welcome reception, safety briefing, and introduction to key members of our crew, a delicious Vietnamese Welcome Dinner is served in Le Marche Dining Room. Following breakfast traditional sampans sail past the city’s beautiful French gothic cathedral before touring the historic Ba Kiet House and its beautiful surrounding gardens. Your sampans then travel to a traditional rice factory where workers produce rice paper, rice wine, popped rice, and many varieties of traditional candies; then return to the ship for a sumptuous lunch and a scenic cruise upstream to Sa Dec. Upon arrival to Sa Dec, your sampans return for a leisurely, scenic navigation of the narrow canals of the Mekong, where you will observe daily routines of the villagers en route to the historic town of Sa Dec. A stop at a local brick factory reveals the process of brick making by local men and women utilizing clay from the Mekong River. In the town of Sa Dec you visit the home of Mr. Hyun Thuy Le, the inspiration of Marguerite Duras’ novel, L’Amant (The Lover), and walk through the town’s market, experiencing the sights, sounds, smells, and wonderful photo opportunities found in the colorful fresh produce, meat, and live fish and seafood for sale. Experience vastly different ways of life along the Mekong Delta today when sampans sail to a temple of the Cao Dai religion, one of the unique amalgam religions founded in Vietnam in an effort to stop the fighting between various faiths. Enjoy a 15-minute ride on a xe loi (local Vietnamese tuk-tuk), to a family-owned mat weaving workshop, before returning to the sampans to visit a floating fish farm and to walk through a local village on Evergreen Island. After returning to the Mekong Navigator and sailing to the Vietnam-Cambodia border, you will spend a few hours processing through immigration before continuing upstream to Phnom Penh, Cambodia. After breakfast on board this morning, cyclo drivers meet you on the pier for an exciting morning tour of Phnom Penh. You are gently transported along the riverfront to the Royal Palace complex, where you enjoy a leisurely walk through the grounds. After viewing Throne Hall and Moonlight Pavilion, you visit the famous Silver Pagoda, home of Cambodia’s Emerald Buddha and the Maitreya Buddha, which is encrusted with more than 9,000 diamonds. Your cyclo is waiting outside to take you on the short ride to the open-air National Museum, housing the largest collection of Angkorian and pre-Angkorian artifacts excavated at the Angkor Temple complex at Siem Reap, as well as other areas around Cambodia. After returning to the ship, enjoy a free afternoon in Phnom Penh—shopping, dining at one of the many wonderful restaurants, or exploring the city independently. An Independent Pursuit to be a Bear Keeper for a Day at the Sun Bear Sanctuary outside Phnom Penh is offered this afternoon. Before dinner, local children entertain guests on our Sun Deck with a cultural performance including Apsara, Cambodia’s national dance, as well as traditional folk dances. This morning, learn more about the darkest days of Cambodian history. After a scenic 45-minute drive from the ship, you arrive at the Choeung Ek killing fields, where you may walk through the fields, visit the small museum and Memorial Stupa, and learn more about the atrocities committed during the Khmer Rouge regime. Before returning to the ship, tour Tuol Sleng (also known as S-21), the former school converted to the main prison and torture headquarters of the Khmer Rouge. Enjoy another afternoon in Phnom Penh on your own or learning to make traditional Khmer dishes through our Independent Pursuit at the La Table Khmer Cooking School before departing Phnom Penh to start our sail up the Tonle Sap River. The ship sails a full day on the narrow, winding Tonle Sap River, which offers a rare glimpse of rural river life in Cambodia. Upon reaching the floating village of Kampong Chhnang you board a private excursion boat for a scenic cruise, where you observe the locals living, working, and even shopping on the river. Enjoy a beautiful sunset while sailing back to the Mekong, watching local children on the riverbanks bidding us farewell as we continue our journey. Please note during certain high and low water conditions, government authorities will not allow us to sail to Kampong Chhnang. During these departures, a visit to the silk weaving village of Preak Bang Kong will be substituted. Preak Bang Kong is a traditional village, famous for their woven silk products. Your walking tour will include a visit to a local home “farm,” where the worms are raised, the silk is handspun and dyed, and women weave the silk thread into fabrics on traditional looms. The homes selected are an excellent place for a little shopping. This morning, the children of a local school welcome you to the local village. The school, which serves eight surrounding districts, is the only secondary school in the area, and is supported by the local communities. Following your tour of the school and an interesting Q&A opportunity with the principal, you walk up the hill to the local monastery of Wat Hanchey and receive a traditional Buddhist Water Blessing from the resident monks. After enjoying a walk around the monastery and the amazing views of the Mekong River valley, you descend 303 steps and return to the ship. Following lunch, motor coaches drive you through the city of Kampong Cham to the hills of Phnom Pros (man hill) and Phnom Srei (woman hill), where you visit the incredible Stupa, the 10-meter long reclining Buddha, and the 13-meter tall preaching Buddha. Today’s final visit is to the 12th century, Angkorian-period complex of Wat Nokor Bachey, which features several original, stone Buddha statues. You gather in Le Salon Lounge this evening for a Farewell Reception with the entire crew, before enjoying a Cambodian Farewell Dinner in Le March Dining Room. Following breakfast this morning you begin your journey from Kampong Cham to Siem Reap, Cambodia, home of the archeological wonders of Angkor Wat. Our 7-night itinerary along the legendary Mekong River, as listed below, starts with a land transfer between Siem Reap and Kampong Cham, Cambodia, sailing downstream to My Tho, Vietnam, and ending with a land transfer into Ho Chi Minh City. The itinerary also operates in the reverse direction, and may be extended with our land extensions in Bangkok, Thailand, Ho Chi Minh City, Vietnam, and/or Ha Noi and Hal Long Bay, Vietnam. 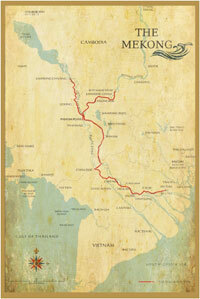 Your midday transfer from Siem Reap to Kampong Cham, Cambodia, ends at the Mekong Navigator. Following a welcome reception, safety briefing, and introduction to key members of our crew, a delicious Cambodian Welcome Dinner is served in Le Marche Dining Room. Enjoy another afternoon in Phnom Penh on your own or learning to make traditional Khmer dishes through our Independent Pursuit at the La Table Khmer Cooking School before departing Phnom Penh to sail downstream to the Cambodia-Vietnam border. This morning you will spend a few hours processing through immigration before continuing downstream to Tan Chau, Vietnam. Experience vastly different ways of life along the Mekong Delta today when sampans sail to a temple of the Cao Dai religion, one of the unique amalgam religions founded in Vietnam in an effort to stop the fighting between various faiths. Enjoy a 15-minute ride on a xe loi (local Vietnamese tuk-tuk), to a family-owned mat weaving workshop, before returning to the sampans to visit a floating fish farm and to walk through a local village on Evergreen Island. Upon arrival to Sa Dec, your sampans return for a leisurely, scenic navigation of the narrow canals of the Mekong, where you will observe daily routines of the villagers en route to the historic town of Sa Dec. A stop at a local brick factory reveals the process of brick making by local men and women utilizing clay from the Mekong River. In the town of Sa Dec you visit the home of Mr. Huynh Thuy Le, the inspiration of Marguerite Duras’ novel, L’Amant (The Lover), and walk through the town’s market, experiencing the sights, sounds, smells, and wonderful photo opportunities found in the colorful fresh produce, meat, and live fish and seafood for sale. Following lunch on board, traditional sampans sail past the city’s beautiful French gothic cathedral before touring the historic An Kiet House and its beautiful surrounding gardens. Your sampans then travel to a traditional rice factory where workers produce rice paper, rice wine, popped rice, and many varieties of traditional candies; then return to the ship for a sumptuous lunch and a scenic cruise upstream to Sa Dec. Following breakfast you say goodbye to the crew as you disembark the vessel and transfer to Ho Chi Minh City, Vietnam. Lecture during the transfer: Ho Chi Minh City—from Khmer Seaport to Booming Metropolis.